Equipment Line covers below-the-hook and material handling units. Below-The-Hook equipment include lifting beams, spreader beams, roll lifters, coil lifters, tongs, sheet lifters, and pallet lifters. Material Handling Equipment includes fork truck accessories, material stands, and material baskets. Suited for industrial and construction markets, all products come in standard and fully engineered custom design options. 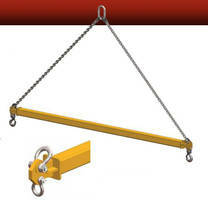 Below-The-Hook lifters are designed and manufactured to ASME B30.20 & BTH-1 standards and Proof-Tested to 125% capacity. Manheim, PA – Harrington Hoists, Inc. recently introduced their new line of Below-The-Hook and Material Handling Equipment. Harrington’s Below-The-Hook offering includes: Lifting Beams, Spreader Beams, Roll Lifters, Coil Lifters, Tongs, Sheet Lifters and Pallet Lifters. The company’s line of Material Handling Equipment is comprised of Fork Truck Accessories, Material Stands and Material Baskets. Harrington designs and manufactures quality made in the USA below the hook and material handling devices for both the industrial and construction markets. Harrington’s new complete line of lifting devices is offered in both standard and fully engineered custom design. All of Harrington’s Below-The-Hook lifters are designed and manufactured to ASME B30.20 & BTH-1 standards and are Proof-Tested to 125% capacity with certificates supplied at no additional charge. Harrington Hoists, Inc. is a Kito Group Company located in Manheim, PA, Elizabethtown, PA, South Holland, IL, and Corona, CA and is a leading supplier and manufacturer of electric and air powered chain hoists, electric wire rope hoists, lever hoists, manual hand chain hoists, push and geared trolleys, overhead cranes, crane accessories, below-the-hook, material handling equipment and a full line of replacement parts. HSSLB Short Span Lifting Beam features low headroom plate style design. HFPSL Lifter Beams feature X-style design. EQ and SEQ Series Hoists come with IP55 rated sealed housing. Manual Hoists and Trolleys feature spark-resistant design. Compact Hand Chain Hoist has Â½ ton rated capacity.